While the rest of Canada and much of the USA are enduring deeply cold weather, we on the "balmy" west coast watch the rain pelt down. It's very grey outside, dull and heavy. The above photo was taken from my kitchen window - you can see how leaden the background is. So let's cozy up by the fire with a mug of tea (I can make coffee, if you'd prefer) and some treats. The photo shows my breakfast bowl of yogurt, berries and nuts, but that's long gone and it's time to break out the cookies. There's some Cranberry Orange Shortbread left, and Nanaimo Bars. My daughter made the shortbread. So pretty, and tasty, too. Help yourself. Take two. There's more in the tins. The paperwhites bloomed beautifully, but didn't seem to have much scent this year. They were starting to fall over and the blossoms dry out, so I gave them a haircut. I don't want to miss any of this bright greenness that is such a wonderful contrast to dull outdoors. Twinkle lights on the mantel help, too. This is a photo from Christmas Day. So pretty. How has your 2017 been? It's been a good year for me, mostly, although aching loss and unfulfilled deep hopes have been a part of it. For the first time there was no parcel to mail to Tim's mum. No phone calls. We miss her. The deep hopes are carried forward into another year and we trust the God who loves us. Several days before the snow, there was frost. This is an untouched colour photo. Monochrome morning. Are you doing anything for New Year's Eve? We won't be at home this year. I took a few fast photos just before the guests arrived to our party earlier in the month. I love cheese, even the smelly blue stuff. I thought the cheese board looked so pretty. But I probably will do things differently next time. The mingling of the nuts wasn't a good idea - some are allergic to tree nuts, others to one kind or the other. The spread in the bottom corner is easy to make, and looks festive. Layer goat cheese with chopped sundried tomatoes, pesto, and fresh herbs in a clear glass container. I used a cylindrical vase/candle holder from Michael's. The clear sides show the layers well. In this week between the years, I hope you are enjoying some moments of quiet reflection. I know that I am. There's not much being accomplished around here. The beef stew mentioned in my previous post was eaten last night as we went out to dinner with friends the previous night. I finished watching The Crown last night. Today I'm doing a little laundry and will head out to do some errands. Reading, some stitching. Nothing pressing. Heavenly! Everything looks just beautiful over there...from the amazing spreads to the ice crystals. You are having rain? Over here it is freezing rain mixed with snow...howling winds and not so pleasant right now. We still have power and for that I am thankful! We are so enjoying The Crown. What a great series! Sounds as if you had a very good Christmas and you're taking advantage of some slow-down days to replenish. We're only three or four episodes into Season 2 of The Crown, but I'm looking forward to the rest. . . Happy New Year! Sounds like a perfect week. Sorry about all the rain, but maybe that's conducive to more quiet at home. all the best in the new year! I think I'd like to come over to your house and sit a spell, drink some tea, eat some cookies but for now... I have to tell you I love that frost picture. It's perfect. My week has been quiet overall, mostly home stuff. I’m perfectly okay with that. Its quite cold here, no snow. Its been lovely to drink warm drinks and read. I finished the crown but started it again with my daughter. We too are having rain whilst the mainland Scotland and Northern England have snow. I would love to pop over and enjoy those beautiful cookies, the shortbread sounds delicious. It is just so nice to relax and do as much or as little as we please. The shortbread snowflakes are so festive! Your food photos are beautiful. They look so inviting. It's 55F in Oregon but the wind is howling and the rain beating down. I enjoyed this season of The Crown. I wonder what next season will be like with Olivia Coleman. I like to watch British shows and she is in a many besides Broadchurch. We will be in a different resort further down the coast for New Year's Eve. Have a Happy New Year! Thanks for a sweet and calming post, Lorrie. I'm still recovering from three days of merry making and it wore me out. I'm afraid my virus has kicked up again, and I am spending hours on end sleeping. It could be worse I guess, but I'm fretting over loose ends everywhere. Your photos are lovely. I personally love rain. A gray sky makes me feel cozy and relaxed. Like the world has slowed down. And yeah, it's definitely bone chilling. And snowing a lot. I'm fortunate that I don't have to go anywhere other than here in the city. My BIL and his girlfriend came in from Vancouver a week or so before Christmas. Isabella made a beautiful spread at my SIL's house where they were staying. A simple burlap runner ran down the length of the table and she served cheese and crackers on pretty platters, silver and white, as well as wood cutting boards. Each platter had a little bowl of bites like olives, nuts, mini pretzels, etc. It was very interesting. I just ordered Netflix so I could watch The Crown. Before I knew it, I found out there was no license from the production company to have closed caption (not sure if you know, I'm almost completely deaf). I was heartbroken. Hopefully I'll find something else to watch on Netflix or I'll cancel after my free month. Any suggestions? Happy New Year to you if I don't see a post before then. I'm trying to put together a Year In Review. Wish me luck! lol! Your week between sounds dreamy and looks lovely. The rain may be getting old, but then again it can be a nice backdrop to reading, relaxing or napping. Though I have eaten way too many sweets, your cookies are calling out to me. Yummy! I like the sounds of that goat cheese appetizer. The flavors are some of my favorites and the colors so Christmassy. Our New Year's Eve celebration will be a low keyed dinner out and then board games until the ball drops. Happy New Year to you, Lorrie. I always enjoy this week before. Your cheese board really looks inviting. Yikes...there are so many things to think about with everyone's allergies and other food issues. Those cookies really do look delicious. Our daughter is hosting a birthday dinner party for herself here tonight. I set the table and the rest is up to her. A very Happy New Year to you and yours! It has been very cold in the East. Mostly, I have been hunkering down with books recouping from a wonderful, busy time with family & friends over holidays. Today, I have challenged myself to 20 min declutter of each room in condo to welcome in the New Year. Your week sounds so peaceful. I worked and all the families and children were a bit crazy. I spent 8 hours today putting away Christmas and cleaning things from top to bottom. Well I still have a bit to do on the bathrooms upstairs and my bed sheets but that can be done tomorrow. As for now I need a cup of tea and one of those cookies if you don't mind. Slower days are so good, and often leave us feeling so refreshed. 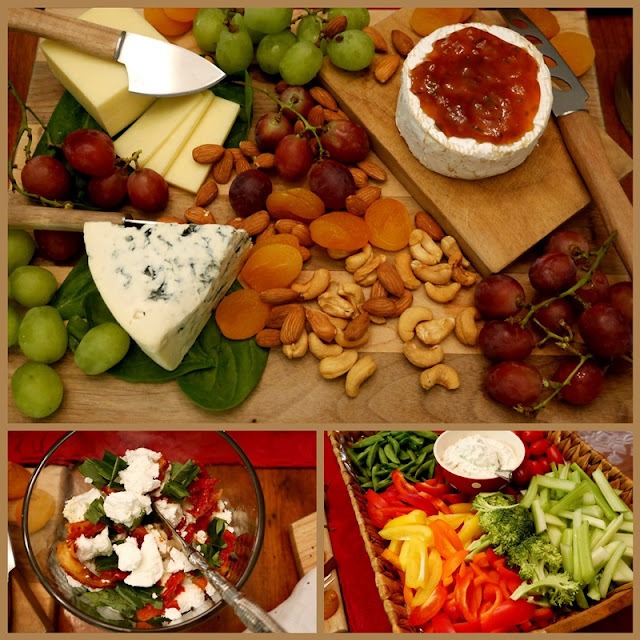 Beautiful photos--love the cheeseboard and even your vegie tray is elegant. Our New Year's Eve here in Kansas will be low key, spent with two other couples who are comfortable friends grown dear over years of time. We are in a cold advisory here, with windchills of 20 below predicted. Your Ladyship mug reminded me of Downtown Abbey. I'm also in complete "holiday sloth" mode (I can't recall who coined this term on social media). HA! We signed up for a free trial on Netflix so I can finally watch The Crown and other shows on my watch list...it'll be tough to return to work next week. Happy New Year, Lorrie! Lorrie - what a tasty smorgasbord of photos. I prefer savory foods over sweets, so I'd dig into the cheese board over the cookies! It is 12 degrees F right now, but at least the sun has reappeared after a 3-day snow storm. So pretty glittering on the snow. We have had a superb 2017 - retiring and starting our log home. So to celebrate we will brave the cold temps today to go to the events at the ski resort - rail jam, torch parade, fireworks and music. Wishing you a very Happy New Year! Lorrie, our temperatures are dropping but we too sit by the fire and don't mind the cold. Your party fare looks scrumptious and if I were your guest, I would never leave. You'd have to boot me out! Happy New Year! Lovely photos, Lorrie. Your cookies look very tempting indeed and, just in case, I much prefer tea to coffee :-) Happy New Year, my friend. What a fun post Lorrie and Happy New Year to you and yours. I shall have some Lavender tea if you have any and a quick drop of honey. Those Cranberry orange shortbread cookies look like my kind of treat...yes one please...it is after all the new year as I write, and well...I promised myself. I think your weather is quite similar to what we have been having. Your cheese board is beautiful. Love paper whites, but this is the first year in a long time that we didn't start any. So I will just imagine with seeing yours. I will take a Nanaimo bar with a cup of tea too. The cookies look so good and I do love those bars.